Three things that I happen to love are food, photography and France, not necessarily in that order. This week’s Website of the Week has all three of my favourite things. It is Lucy’s Kitchen Notebook and it is a fantastic smorgasbord of fine French cuisine, first rate photography and wonderful stories about life in Lyon and the surrounding environs. I hope that you enjoy it. 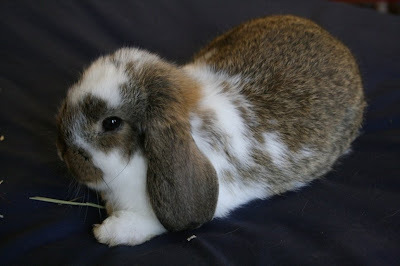 As a bonus this week, I have posted a photograph of Thistle the rabbit just so you may take in the major cuteness factor. 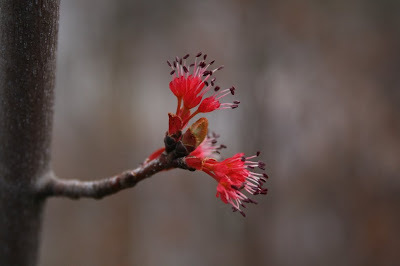 I am hoping that the weather isn’t as nice next week so there will be less daydreaming in the woods and more blogging happening. 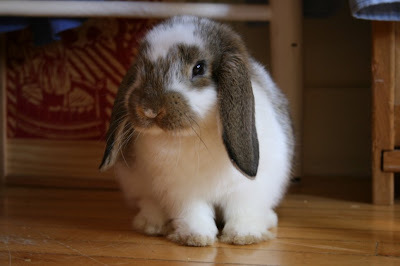 In the mean time, gentle readers, I thank you for your patience. 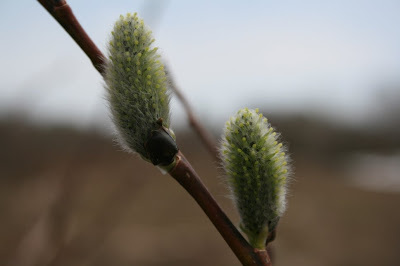 Spring is busting out all over in so many ways that it is hard to keep up with it. So I thought that I would give you an update today on what is happening here. Our weather has been splendid with four straight days of sun and a temperature of 19°c expected today. It has been hard to stay indoors and blog. The crocuses are now blooming everywhere. Daffodils, tulips and tiger lilies are just beginning to poke their heads out of the ground. The birds have noticed the change of seasons. Yesterday there was a flock of maybe fifty cheerful little redpolls in my backyard. They are massing for the journey north to their summering grounds. You can read more about the redpolls in my previous post here. The purple finches and goldfinches are spending less time at the bird feeders. Soon the goldfinches will molt, with the males putting on their bright yellow coats for the summer. There are flocks of grackles about with their noisy, squeaky clothesline pulley voices calling from all directions. The flocks of robins are beginning to break up with individual males staking out their territories by filling the air with their song. The snow has pretty much all melted and the robins spend time scouring the lawns for big, juicy worms. Everywhere you can see nest building activity. There are quite a few crows in my neighbourhood and there are at least two nests being built within sight of my backyard. I’ve seen pigeons, mourning doves and starlings all gathering nesting material and then flying off on their urgent mission. The woodpeckers have begun drumming on the trees again. The ice is lifting from the ponds and marshes and there are waterfowl everywhere. The Canada geese and the ducks are looking for just the right place to situate their nest and raise the first broods of the year. 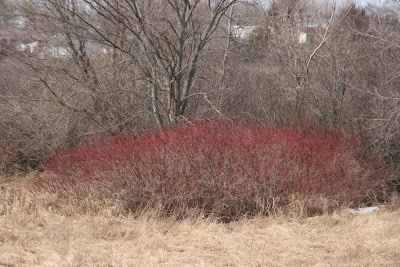 There is a splendid marsh within walking distance where hundreds of pairs of waterfowl will make their home for the season. 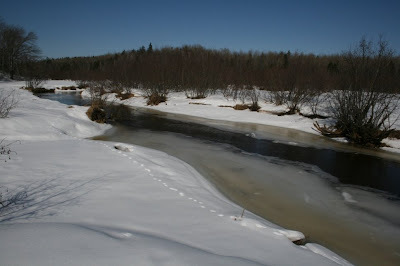 Since we had a lot of snow this past winter the spring runoff has swollen the brooks and streams to their limits. Soon some of us will hike out to our favourite streamside places and pick fiddleheads to have with a meal of fresh salmon and new potatoes. This is the quintessential springtime New Brunswick meal. Today was officially “the first nice day of the year”. 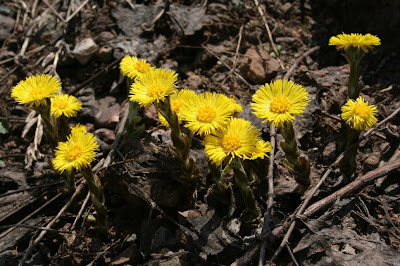 I am declaring it so, what with sunny weather and temperatures near 19°c. On our walk today we saw a flock of robins, a number of crows engaged in nest building, purple finches and crocuses blooming everywhere. Everyone’s spirits were lifted by the decidedly spring like weather. I feel sorry for April in British Columbia who woke up to more snow. Phooey! 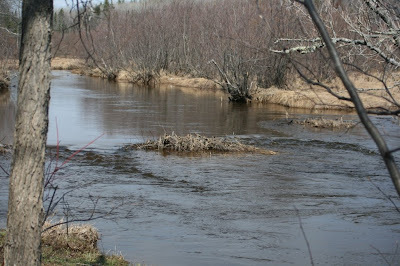 About a month ago I walked out to the beaver dam to see what was going on there. The dam itself has been breached and is a little worse for wear. 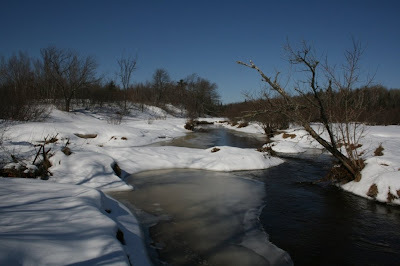 While a beaver dam can last for years, this one will be taxed this year by what is going to be a heavy spring run off. In the spring and summer this little dam creates a large beaver pond that provides habitat and an important ecosystem for a variety of plant and animal species. This work of the beavers provides for water conservation, flood control and also creates an excellent breeding ground for fish. In the summer the water lilies on the beaver pond are beautiful. The beaver (Castor canadensis) is an official emblem of Canada, and rightly so, as this country was explored and opened up by the demand for beaver pelts in Europe for making hats. At the height of the fur trade over 100,000 pelts were shipped to Europe each year. Fortunately, fur hats fell out of favour when silk hats became the rage, thus saving the beaver from extinction. I am always amazed at the sheer amount of work that these animals do all on their own. For their size they are capable of taking down very large trees. 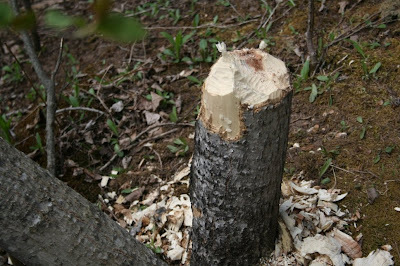 A beaver can fell a four inch thick tree like the one in the photograph in about fifteen minutes. There are reports of trees five feet in diameter felled by a beaver. They are the very epitome of industry and the phrase “as busy as a beaver” is a very apt one indeed. 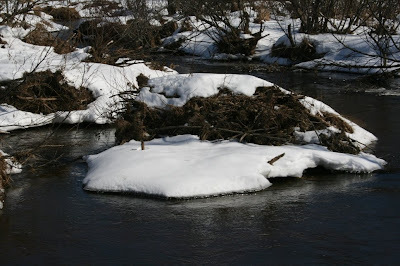 The beaver lodge is made from heavy poles and thick sticks which the beaver plasters with mud. The entrance tunnel is located below the surface of the water. Inside there is a one room apartment with a floor covered in shredded bark that is just above water level. Beavers mate early in the year and two to six kits are born about four months later. Although it looks serene from the outside, just imagine the family activity that must be going on inside with the newborn baby beavers right about now. In polite company the subjects of religion or politics are avoided. Just this once, however, I want to share with you my views on religion and the environment because I believe that this is so important. Although I am a Baptist boy with very deep roots in the American Baptist Convention, I must admit that my attitude towards going to church can best be summed up by Emily Dickinson’s poem. On a goodly number of Sunday mornings I can be found in the woods where I feel much closer to God than I do in my own congregation. I also come from the long tradition of New England transcendentalists. Henry David Thoreau is my hero. 26 Then God said, "Let us make man in our image, after our likeness; and let them have dominion over the fish of the sea, and over the birds of the air, and over the cattle, and over all the earth, and over every creeping thing that creeps upon the earth." 27 So God created man in his own image, in the image of God he created him; male and female he created them. 28 And God blessed them, and God said to them, "Be fruitful and multiply, and fill the earth and subdue it; and have dominion over the fish of the sea and over the birds of the air and over every living thing that moves upon the earth." 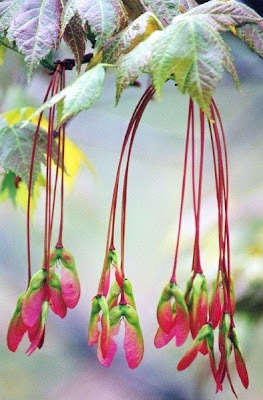 29 And God said, "Behold, I have given you every plant yielding seed which is upon the face of all the earth, and every tree with seed in its fruit; you shall have them for food. 30 And to every beast of the earth, and to every bird of the air, and to everything that creeps on the earth, everything that has the breath of life, I have given every green plant for food." And it was so. 31 And God saw everything that he had made, and behold, it was very good. And there was evening and there was morning, a sixth day. I firmly believe that we all have a moral obligation to safeguard the environment. Further, I believe that as Christians we are directed by God to exercise stewardship over the world around us. In recent days more than 40 leaders of the very fundamentalist Southern Baptist Convention have signed the Southern Baptist Declaration on the Environment and Climate Change. This is a truly remarkable step in the right direction. Imagine how far we can go if the church puts its authority behind responsibility for climate change. Imagine what could happen if we restore stewardship to its rightful place. 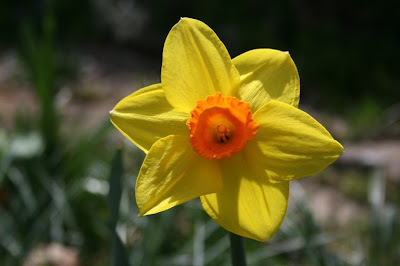 Today’s photograph of a jonquil is inspired by my dear friend Helen’s mother-in-law’s daffodils which are now blooming in her backyard. 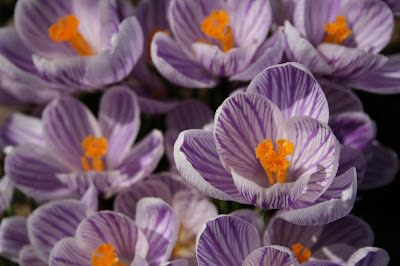 One of the most familiar of the early spring blooming flowers is the Crocus. Crocuses are members of the lily family (Iridaceae), and there are about eighty species of them. 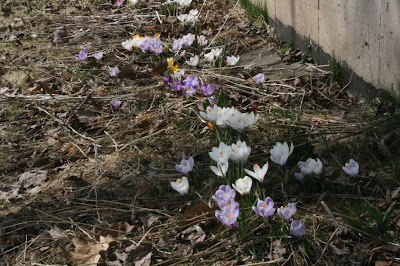 Even though there are still snow banks about in my locale, the crocus bulbs that are planted next to a south facing wall or foundation are now beginning to bloom. Soon the park next to my house will be awash in their bright yellow, white, purple and variegated blossoms like the ones in today’s photograph. There are a number of interesting crocus species. I am particularly fond of the wild prairie crocus found in the province of Alberta. 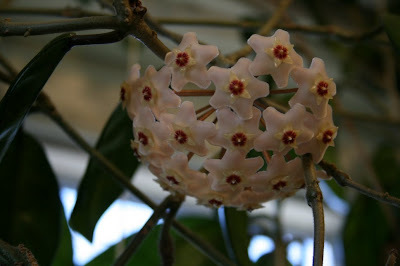 It is much more delicate than the cultivated variety. A species of autumn blooming crocus (Crocus sativus) is the plant that the spice Saffron comes from. The stigmas of the flower are carefully picked and dried in a very labour intensive process, thus making saffron, pound for pound, one of the most expensive things in the world. Winter here will still last another few weeks. Just about everyone is tired of it and when we finally do get that first really warm spring day everyone’s persona will perk up noticeably. In the meantime we will just have to make the best of things. It snowed a little bit overnight which gives us an opportunity to discover many of nature’s little dramas being played out right in our own backyard. We can do this by observing and interpreting the fresh tracks left behind in the snow by our animal friends. It’s pretty clear that the neighbourhood cat was strolling through the yard when it discovered a mole or shrew underneath the snow. A brief scuffle ensued whereupon the feisty feline had breakfast and then went upon its way. Fresh snow affords us the best time to study the various animal tracks and learn how to read the signs. In today’s photograph some small animal, perhaps a fox, made its way all along the edge of the stream. Nothing distracted it and nothing disturbed its gait as it went about its business. I wonder where it was going and what it did when it got there. 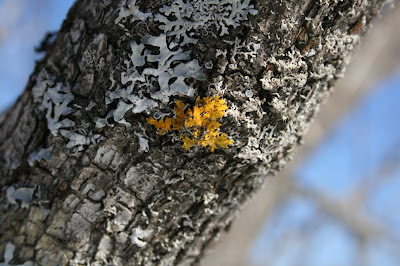 You will be amazed at the nature stories you can discover with a little bit of observation on your part.